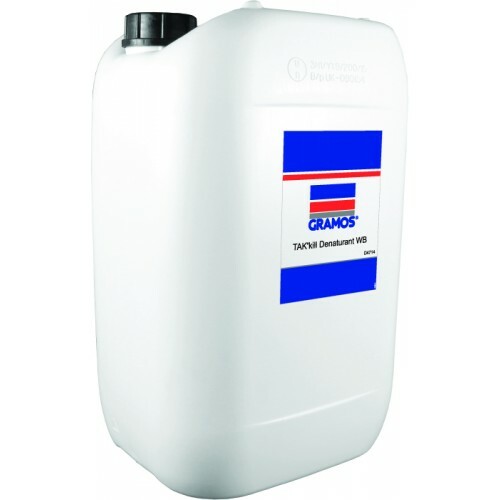 Gramos / Orapi's TAKkill Denaturant WB is a liquid preparation consisting of a solution of alkalis formulated for use as an additive for spray booth water treatment. As TAKkill Denaturant is a liquid the disadvantages associated with dissolving powder alternatives are eliminated. TAKkill Denaturant WB has been developed for the treatment of over-spray paint in paint spray booths, particularly of the conventional pump type. Reaction between the over-spray paint and the TAKkill Denaturant WB solution in the spray booth ensures that washing chambers, plates and pipe work of the spray booth require less frequent cleaning and the treated paint will float in a conventional denatured non-sticky form for easy removal.